Amazon.com description: Product Description: Social media's connectivity is often thought to be a manifestation of human nature buried until now, revealed only through the diverse technologies of the participatory internet. 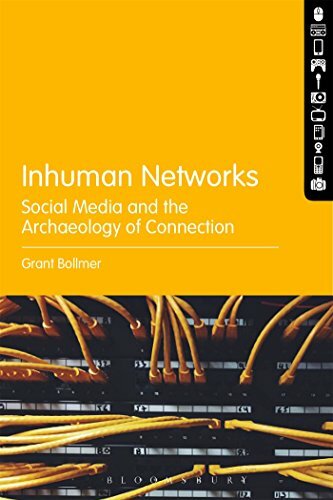 Rather than embrace this view, Inhuman Networks: Social Media and the Archaeology of Connection argues that the human nature revealed by social media imagines network technology and data as models for behavior online. Covering a wide range of historical and interdisciplinary subjects, Grant Bollmer examines the emergence of âthe networkâ as a model for relation in the 1700s and 1800s and follows it through marginal, often forgotten articulations of technology, biology, economics, and the social. From this history, Bollmer examines contemporary controversies surrounding social media, extending out to the influence of network models on issues of critical theory, politics, popular science, and neoliberalism. By moving through the past and present of network media, Inhuman Networks demonstrates how contemporary network culture unintentionally repeats debates over the limits of Western modernity to provide an idealized future where âthe humanâ is interchangeable with abstract, flowing data connected through well-managed, distributed networks.